After having read the novel Worthy by Catherine Ryan Hyde, I've become a big fan of this author. So when the opportunity through NetGalley came to read her latest novel, I jumped at it. 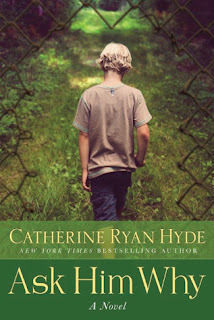 Here is more about Ask Him Why by Catherine Ryan Hyde as well as my review. 10 Years Ago - When Joseph comes home from Iraq after only three-and-a-half months there, the family knows something is terribly wrong. In a matter of days, they find out just how bad things are, and by then, Joseph has disappeared. Over the months, the family endures pressure from the media and ridicule from the entire country. And the glaring question on everyone’s mind remain unanswered. Why did Joseph desert his company and his country? Told through the eyes of Joseph’s teen siblings, Ruth and Aubrey, this story explores a family that was already broken long before Joseph’s betrayal. We see all that these two young people endure as they come to grips with this life-changing experience. And the question remains—why did Joseph do it—yet no one bothers to ask. Ten years later, they come face-to-face with their brother again. But will it be easy to forgive and forget? Ask Him Why is a realistic, thought-provoking story filled with interesting characters. This is no Leave it to Beaver family. It’s a family with real problems which become even larger because of what Joseph did. You don’t fall in love with these characters, you feel for them, and that is the sign of a true storyteller. Catherine Ryan Hyde has created a story and characters that will haunt your thoughts long after you’ve finished reading. I hope you will pick up this story. It’s one you will certainly think about for a very long time. See my review of Catherine's other novel, Worthy.